Keep your privileged accounts safe with a faster and easier solution for Privileged Access Management. Managing privileges throughout their life cycle can be extremely challenging. Setting up, rotating, removing and monitoring passwords takes time and effort. 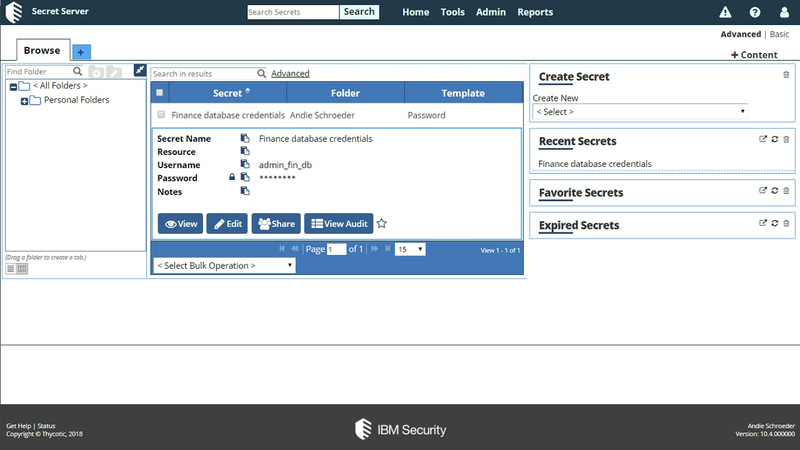 With IBM Security Secret Server, you’ll automate these actions and manage privileges with policy-based controls. IBM Secret Server protects privileged accounts from hackers and insider threats, helps ensure compliance with evolving regulations, and allows authorized employees to seamlessly gain access to the tools and information they need to drive productivity. Lock down sensitive account passwords. Ensure credential integrity with auto-discovery, password rotation and a "heartbeat" feature. Improve standings with auditors and maintain compliance through password management. Know exactly who has access to key systems. Run a quick deployment with an intuitive administrator-experience, robust APIs, and out-of-the-box support.